Forex Trade Analytics – Taking it to the next level! Analyzing your account as a whole might not always be enough – pinpointing the exact issues might be a very difficult task but using Myfxbook definitely helps :). Although we’re proud to have the best and most useful tools for this task, we’re always looking for new ones and as a pioneer in forex trading analysis, we design and create unique tools giving you an edge unavailable anywhere else. We’re excited to reveal the result of our hard work which is one of the most powerful additions to your tool-box: Trade Analytics. Time Profitable – how long was the trade profitable in percent and in absolute time. Drawdown – worst drawdown experienced during the trade’s lifetime, in pips. 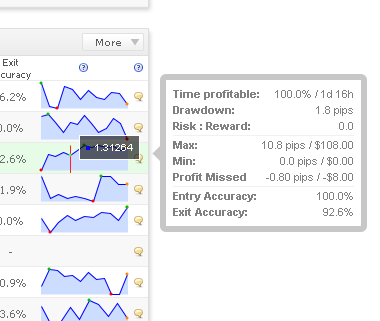 Max – the max profit of the trade experienced, in pips and money. Min – the min profit (highest loss) of the trade experienced, in pips and money. Risk : Reward: the risk:reward ratio of the trade (based on the max and min values of the trade!). Profit Missed – how much profit did you miss by not exiting on time (profit which was already yours). Entry Accuracy – how accurate was your entry. Exit Accuracy – how accurate was your exit. Efficiency figures identify how much of a trading range your forex trading system captures. The trading’s range timeframe is defined by your trade’s entry and exit points and the price range is defined by the trade’s high and low values. You can sort your trades based on these new metrics by clicking the ‘more’ button in the history section and adding the new metrics. Please note the above statistics are supported for over 50 different forex pairs and will be available only for verified accounts and for recent trades (which is another great reason to connect your forex trading account to Myfxbook as soon as you open it! :)). 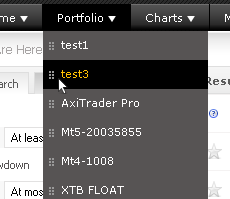 You might have noticed a small handle next to each account/portfolio in the Portfolio menu – you can now move around the items to reorder them as you wish and it will be instanly saved (remember you can create and manage your portfolio groups through your settings area, ‘Manage Portfolios’ button). Just as in the website, the widget is self updating the data. Get the code on https://www.myfxbook.com/forex-broker-volume (green ‘add to site’ button) and place it in your blog/website). Do let us know what you think and if you have any suggestions/comments. 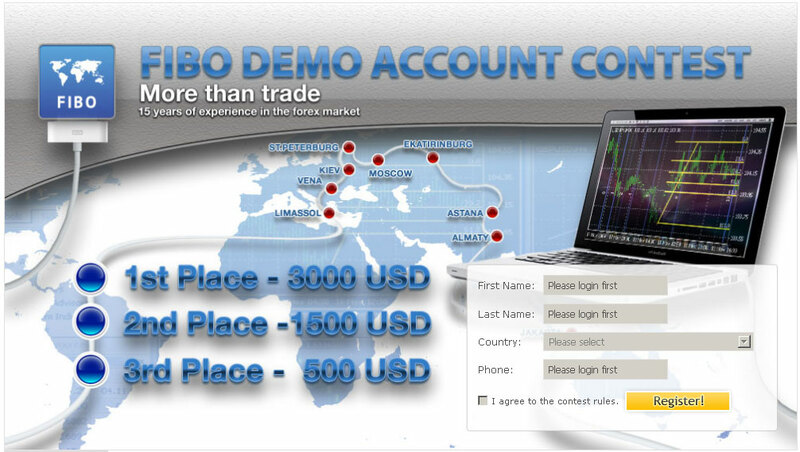 We’re happy to announce the first forex trading contest for 2013! This forex contest will start on February 1st, so you have less than 2 weeks left to register. Clicking on a specific volume value will lead you to a real-time volume chart of that specific currency and broker in question for the last 48 hours. Just as with the spreads section, you’ll see volume session averages below the chart, brokers with higher volume, a volume chart with economic events, ability to save the volume chart and also analyze volumes in real-time for different time-frames by zooming in and out of the chart. Up until now it was impossible to know and compare volumes of different brokers. Why would one want to do that you may ask? The answer is that higher volume means higher liquidity which translates to lower (or better) spreads. 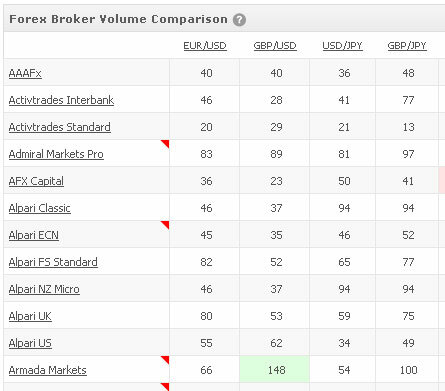 Now you can view and compare forex broker volumes in real time for over 80 different brokers! 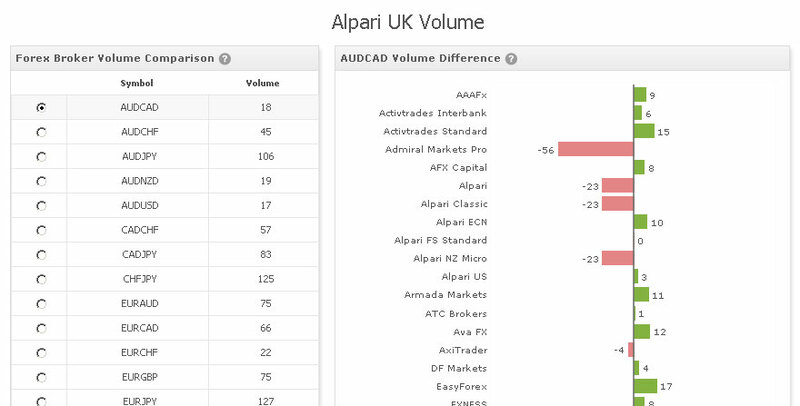 You can see which brokers have the lowest volumes and which ones have the highest volumes for over 100 different currencies. Like the new features? Want us to add another section? Let us know by commenting below or sending us a message. The login panel got upgraded and now you have a real-time activity and messages notifications! No matter which section you’re currently viewing, you will receive in real-time a notification on anything related to your account. You can preview the notifications in the login panel quickly or go to the section in question using the links at the bottom of each pop up window. Looking for a free and most sophisticated economic calendar widget? You just found it! Wish you a great 2013 ahead! 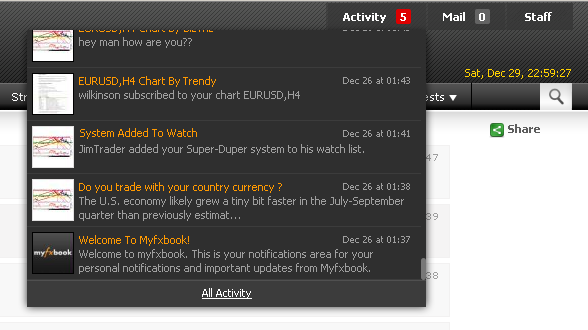 You are currently browsing the The Myfxbook Blog blog archives for January, 2013.